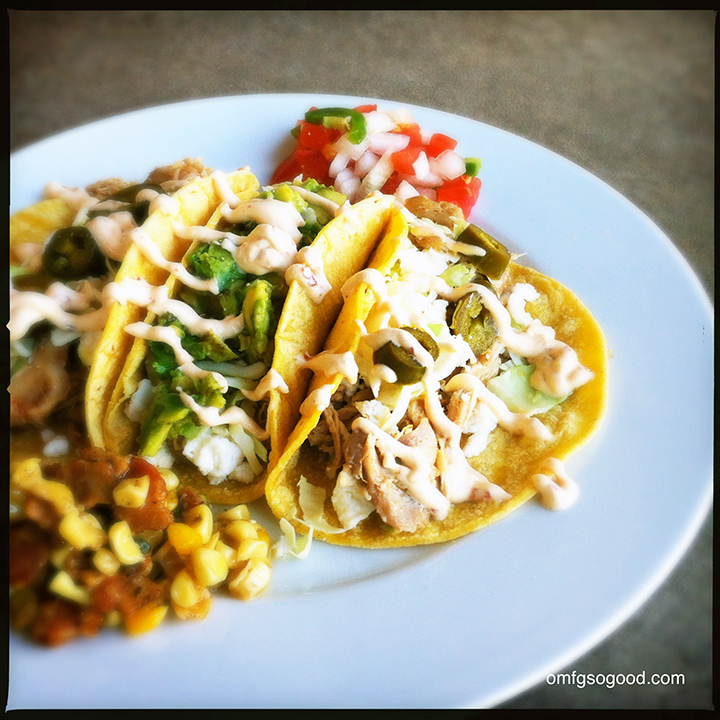 chicken tacos with chipotle crema | omfg. so good. Okay, forewarning. The image below screams ‘gluttony’. I know, I know. It couldn’t be helped. I ate my lone taco in, like, 3 seconds flat because it was that good, so I was left with Jonny’s ginormous plate of tacos to document this awesome summer meal. Seriously, I don’t know how he manages to stay so svelte. Is svelte the right word to describe a man? If it’s not, it should be. Because he’s ding-dang svelte. Anyhoo. Back to the tacos at hand. These made for the perfect summer meal. Lounging by the pool just as the sun starts to descend through the palms, munching on street style chicken tacos, sipping on mango lemonade margaritas. Pretty spectacular visual, if I do say so myself. To make the chicken, preheat the oven to 375 degrees. Clean the chicken thighs of any remaining weird looking stuff then arrange them in a single layer on a parchment lined sheet pan or glass baking dish and drizzle with 2 – 3 tbsp olive oil. Peel and cut the garlic cloves in half and arrange the pieces on top of the chicken thighs. Rough chop the onion and arrange that on top of the chicken thighs, along with the sprigs of thyme. In a small bowl, combine the paprika, cumin, salt, and pepper. Sprinkle the seasoning blend evenly over the top. 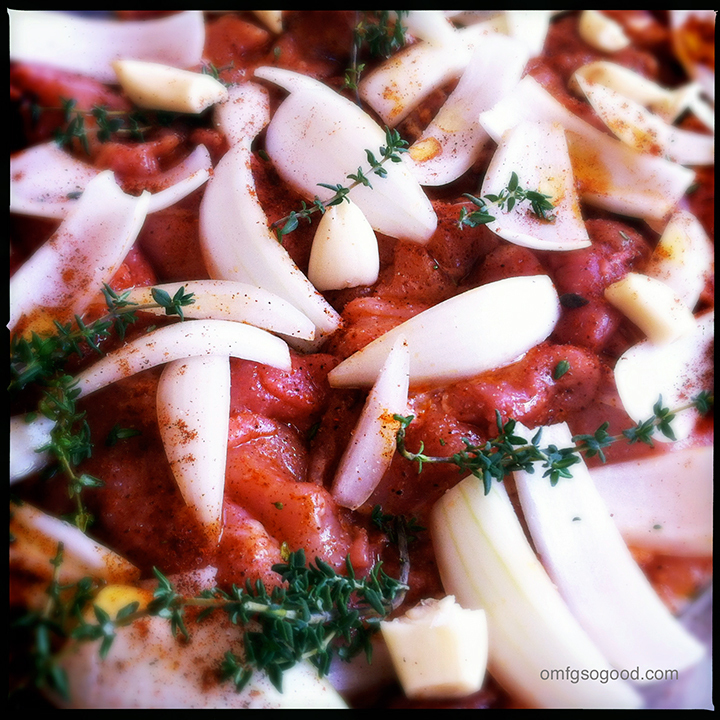 Roast in the preheated oven for 30 – 35 minutes, or until the chicken is completely cooked through. While the chicken is roasting, prepare the Chipotle Crema by combining the sour cream, half and half, chipotle sauce, lime juice and honey in a small mixing bowl. Give it a taste, then season with salt if you think it could use some. Cover and refrigerate until ready to serve. When the chicken is done roasting, remove it from the oven and transfer the meat to a large bowl. Discard the rest of the contents of the pan. Using two forks, shred the cooked chicken into bite-sized pieces. To assemble the tacos, warm the corn tortillas in a hot skillet for 3 – 5 seconds on each side. 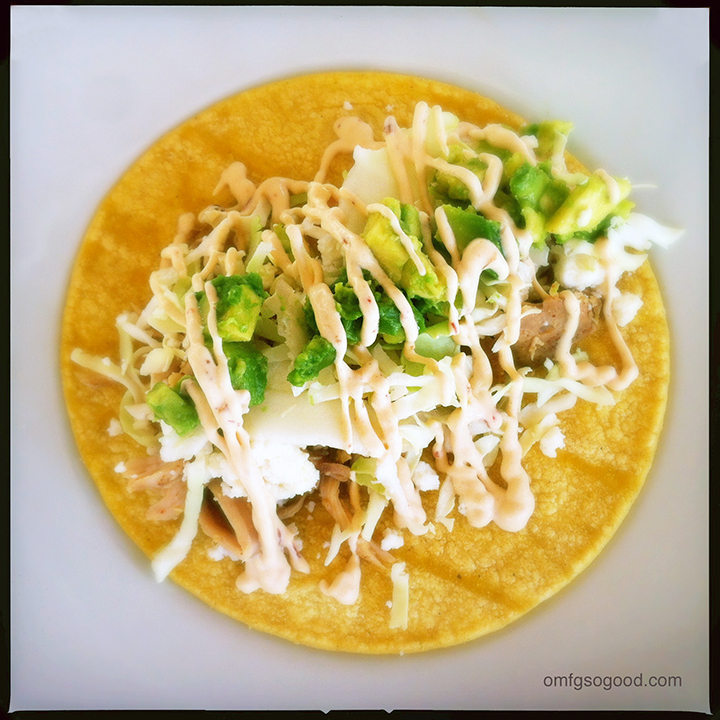 Lay them flat on a plate, add a layer of chicken, top with shredded cabbage, queso fresco, diced avocado, a squeeze of fresh lime juice and a generous drizzle of Chipotle Crema. Add pickled jalapeño slices if you’re like Jonny, who prefers his tacos with an extra little kick. Or if you just want to justify the need for a second mango lemonade margarita. You know, to conquer the spice on your tongue. Not gonna lie, I’ve used that excuse before. omg it looks so good I want to DIEEEEEEE!!!! Pingback: sesame ginger shrimp tacos with wasabi crema | omfg. so good. I love it and it was a complete hit at home!! !